RichCity Idol winner Ysabelle Santa Ana from Richmond Secondary School. 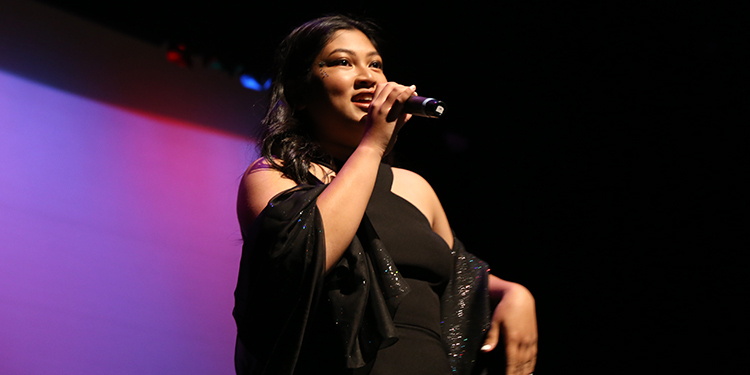 When Grade 12 Richmond Secondary student Ysabelle Santa Ana was crowned the winner of RichCity Idol 2018, her abundant and enthusiastic crowd of fans went wild. The theme of the singing competition’s 15th anniversary was “City of Stars,” but the unofficial theme threading its way through the night was celebrate your own unique voice. The evening saw 10 students from each of the Richmond high schools competing to be “the shiniest star out there,” according to co-hosts Anna Leung and Marinelle Sinlao. The co-hosts offered an evening of elegant introductions coupled with punny comments after each performer’s turn. The three-member judges’ panel spanned the music scene. Bruce Nip is a producer and host of a weekly music show on Fairchild Radio. Known by her performing name, Michele C, is a songwriter and recording artist in the EDM and trance scene. Rounding out the group was Trevor Hoffman, a pianist, composer, and producer. All 10 students sang “This Is Me” from 2017 film “The Greatest Showman” to open the show, as they gathered around three microphones, each with their own chance to shine during the number. The first solo performance came from J.N. Burnett secondary student Darren Zhang, who chose John Legend’s “All of Me.” A different backing track came up first. Zhang waited calmly for his music to begin before delivering a strong ballad. Eventual winner Santa Ana sang second, performing “Halo” by Beyoncé. Santa Ana handled the crowd well, asking them to use their phones to create beams of light befitting the song’s title. R.A. McMath secondary’s Julien Norrish, another Grade 12 student, also sang a Beyoncé song: “Listen.” Despite his microphone not working when he started, his confidence built. The audience recognized the song and clapped along. The youngest participant of the evening was Steveston-London secondary student Kiran Bassi, who is in Grade 8. She sang Rihanna’s “Love on the Brain,” and her performance was remarkable given that her backing music cut out after the first few stanzas. She continued a cappella, finishing out the chorus with professional stage presence beyond her years, before stopping to thunderous applause. Judge Nip said: “Without the music I really truly heard your very talented voice. You hit every single note.” All three judges expressed a strong desire to hear Bassi sing again with the accompaniment as planned. Singing fifth was Brazilian exchange student Augusto Tonial, in Grade 12 at Hugh Boyd secondary. He chose Twenty One Pilots’ “House of Gold,” which is accompanied by ukulele in the original. Tonial accompanied himself on acoustic guitar and harmonica. When the lights came up, his fans shouted his name. He had stage presence to burn as he charmed the crowd. His guitar had no sound at first, so he stopped, waited for the sound people to turn up the volume. Once it was working, Tonial had the audience clap along. Francis Naluz, a Grade 12 student from Matthew McNair secondary, sang “Supermarket Flowers” by Ed Sheeran, which gave way seamlessly to a surprise mashup with Coldplay’s “Fix You.” He also accompanied himself on acoustic guitar, true to Sheeran’s original song. A.R. MacNeill secondary student Jeremy Tong was scheduled as the penultimate performer. He sang “A Million Dreams” from “The Greatest Showman,” which proved to be a choice supported by the judges. When asked what music has done for him, Tong said it’s important because: “I’m not good at studying. Without music I’m just done.” His singing would be right at home in a Disney movie. The last scheduled performance came from Cambie secondary student Tiana Noureddin, who chose “When I was Your Man” by Bruno Mars. Her stage movement looked professional, and she used the whole stage with confidence. Judges C and Hoffman compared her voice to the likes of Norah Jones. Noureddin said: “Music is the one kind of art that I’m actually decent at.” While jazz may be in her future, her substantial scholarship to study engineering at the University of Victoria will take precedence for the next four years. The audience erupted in cheers when Kiran Bassi got her second chance to sing, this time with the accompaniment as planned. With a voice mature beyond her years, Bassi nailed her second performance. She had the crowd with her all the way, clapping in time from the start. Throughout the night, hosts Leung and Sinlao mentioned the event’s sponsors: Richmond School District, Richmond City Centre Community Centre, CCIM Entertainment Group Addiction Sportswear, The Richmond Sentinel, Richmond Olympic Oval, DavidsTea, Nature’s Path Organic, Panago Pizza. Blanche Macdonald did the makeup, giving everyone on stage sparkling stars at the corners of their eyes. After all the solo performances, hosts drew the door prizes. While all were welcomed, the two that brought the house down were Apex Adventure Plex’s passes and then even more so, five $50 gift certificates from White Spot. The top five Idols were Chen, Naluz, Santa Ana, Tong, and Bassi. Each performed a very brief a cappella taste from their number. During intermission, the audience voted for their choice for winner from among the top five. After intermission, two CCIM groups gave enthusiastic performances: the Rising Stars and Cassie B Adam S. This was followed by two videos: one on the Richmond School District and one on CCIM Entertainment Group. The hosts singled out Richmond School District’s Assistant Superintendent Wendy Lim for her support. According to Lim, they stepped in after spring break to ensure the event had adequate sponsorship to guarantee RichCity Idol would run for its fifteenth year. Then, the tension built as each of the three finalists was announced, first Tong, then Bassi, and her large fan base erupted with Santa Ana’s name was called. The three huddled together, awaiting the news. Santa Ana was pronounced the winner. Her fans again cheered at an ear-splitting volume of joyous celebration. All 10 finalists came together in a group hug, chanting Santa Ana’s name. To close the evening, the group of 10 sang Sam Smith’s “One Last Song” with each taking a brief solo turn. At Santa Ana’s solo, her fans’ ear-shattering cheers and signature cowbell erupted as balloons dropped from above. The students relished the moment, later joining their awaiting fans in the Gateway Theatre. RichCity Idol 2018 was at a close.